Ask anyone who doesn’t live there what’s happening in Adelaide and the answer is bound to be either “church” or “nothing”. But in the past few years Adelaide has stepped up its game and it now boasts – apart from pop-up bars and a hipster coffee shops – a tight startup community that reminds me a bit of the early days of Fishburners in Sydney. Champions in the community are driving a collaborative, co-working and co-learning ecosystem and I’d say watch out for new companies that emerge from Adelaide’s burgeoning startup scene. Last Friday we had the pleasure of being on the judging panel for Adelaide’s MegaPitch event. 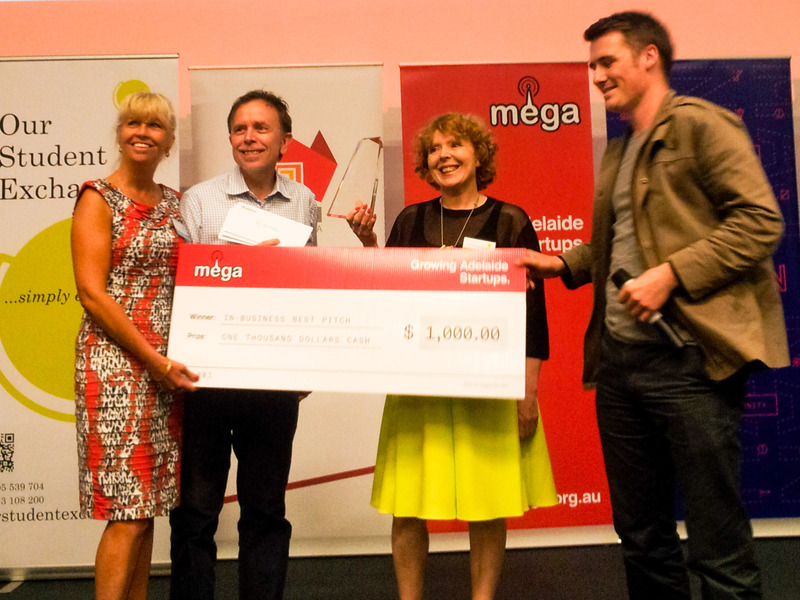 MEGA is a 3 months startup pre-accelerator program in Adelaide. Over a 13 week validation period participants receive support from MEGA’s vibrant community of founders, successful mentors and space to work at Majoran Distillery. Early stage support and encouragement to just go out and DO SOMETHING is a vital part and a good indicator that the ecosystem is growing, so we were delighted to be invited to see the participants pitch. One of the prizes for the winning pitch was a three hour strategy workshop with BlueChilli worth $3,000. BossCamp – a suite of entrepreneurial education programs in an event context specifically tailored for young people 14-18 years old. They enable teenagers to take entrepreneurial action, learn to code and explore innovative solutions in parallel with education. Our Student Exchange – a purpose built online administration tool for international exchange coordinators, providing direct integration of all necessary information for a successful exchange program. Makes You Feel – a widget that lets you rate and measure the emotional impact of an online message, whether that’s a blog post, a song on iTunes or a brand’s advertising message. The Co-Working Society – a social platform for connecting developers, entrepreneurs and freelancers around peer-reviewed co-working spaces, formal and informal, around the world. CrowdHeal – a reactive and proactive health management website which uses the data collected from individuals to help understand what could heal or reduce a person’s symptoms for a range of diseases, particularly non-communicable diseases. Noshie – Noshie is an online media company featuring a series of webisodes of chefs preparing meals, which can then be bought for delivery via the site and paired with a recommended alcoholic beverage. The judges and the winners – hard to tell who’s more excited! Who wouldn’t want a big novelty cheque? There were awards for best business plan, biggest pivot, best community member and a generous advertising package from NewsCorp to name a few, but the coveted prize is the glory, giant novelty cheque and a 3 hour strategy workshop with BlueChilli’s CEO that comes for winning the Best Pitch. Best Pitch and overall winner of the MEGAPitch competition was awarded to Renee Buckley and Katie Lea from Our Student Exchange. Not only did they deliver a flawless pitch, but they knew their company’s business model and all the details in the business plan inside out. They had a well-defined problem in a large but targeted market, an elegant business model and a clear path to commercialisation. 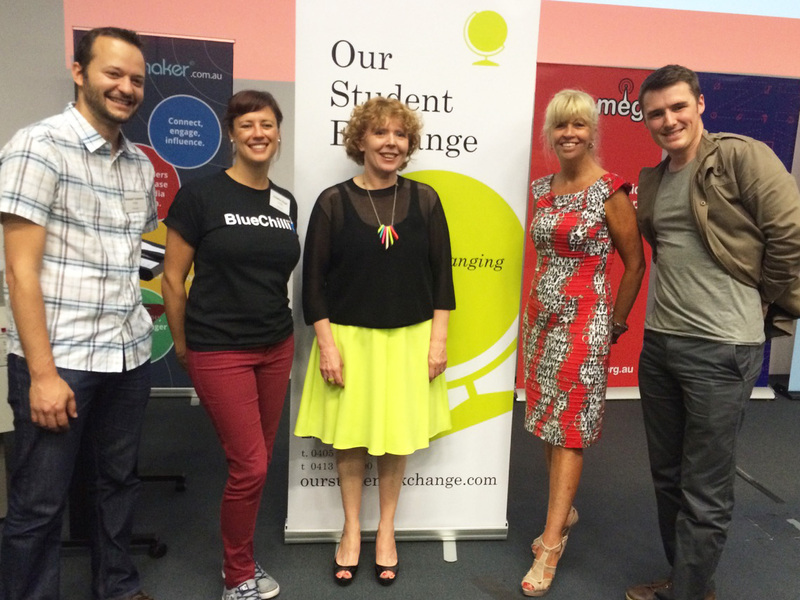 Well done Renee and Katie and we look forward to seeing you again for your workshop to help you take Our Student Exchange onto the next stage in your startup journey!